Here at ICND we are proud of the amazing websites we build for our customers and all the ways those sites help their business. We love building websites, but lately we have been stretching ourselves a little by taking on projects that require a bit of flexibility and innovation. We were recently approached by Fickling Vacation Rentals, a client in the vacation rental market located on sunny St. George Island, about a unique project. The folks at Fickling were very happy with their existing website. The loved the look and feel of the site, however, they were not satisfied with their booking engine, the software that let their guests search properties and make reservations. This is just the kind of challenge that we love to take on. We immediately tasked a team of programmers with finding a way to add the power and usability of our custom built booking engine while preserving the existing aesthetic of the site. 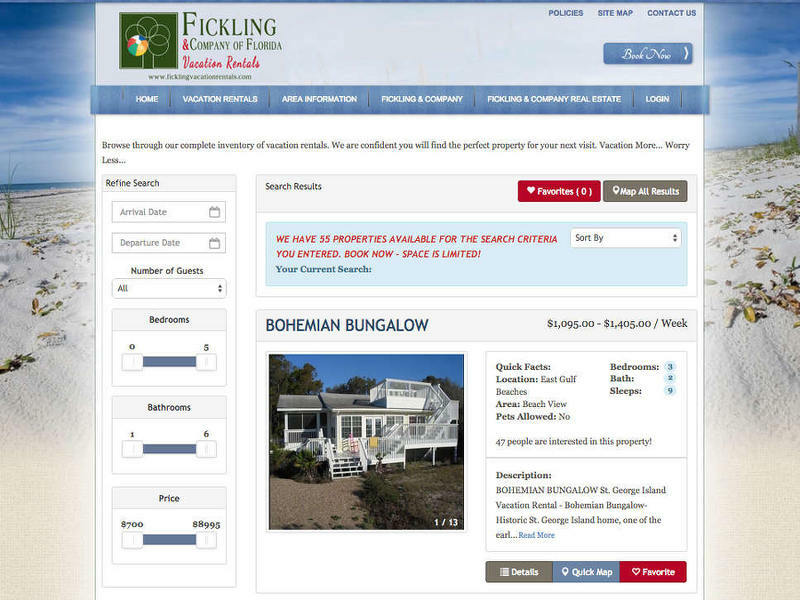 Fickling Vacation Rentals had plenty of reasons to search out a better booking engine. Many of our clients tell us that one of the hardest parts of their business is helping potential guests find the right property and then getting them through the reservation process in as few steps as possible. When we were developing our booking engine we took these concerns very seriously. The resulting software is optimized for conversions, packed with user-friendly search features and removes as many barriers to reservations as possible. With the project completed Fickling can have everything they want. The same great website with a brand new engine under the hood. With this successful project completed we’re looking forward to working with more clients who challenge us with interesting projects that let our experts put their skills to work.